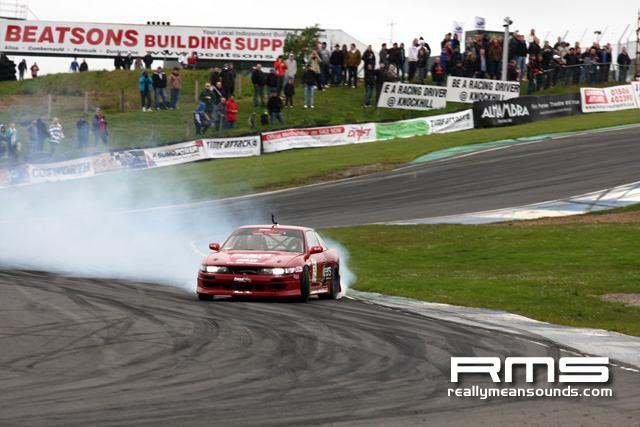 Round two of the European Drift Championship heads way up north to Knockhill circuit in Fife which, thanks to its seriously fast blind-crest entry, is one of the best venues to watch drifting. Its a seriously tough course to master with the perfect balance of speed and angle needs to transition from the entry downwards into a tight right hander, but thats what the EDC is all about. 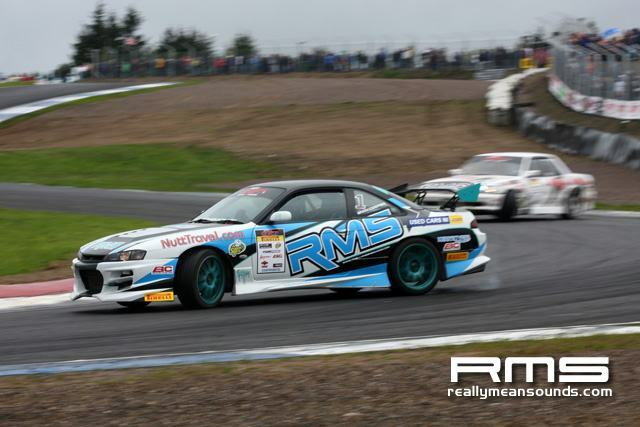 Unfortunately the Turbo M3 of Steve Will and SVA Imports 350Z driven by Tim Marshall were unable to make Knockhill due to car problems, but local-lad Kieran Cameron stepped up in his bright yellow PS13 sporting a Chevy V8 up front the only N/A car running in the EDC and what a noise. Getting the perfect entry is the trickiest part with speeds approaching 100mph pretty daunting in itself, but when you cant see the track in front of you until youre sideways you really need to keep your nerve to avoid ending up in the gravel. Enter too slowly and youd have to straighten. Go in too fast and youd spin. Paul Conlan kicked off practice showing exactly that. 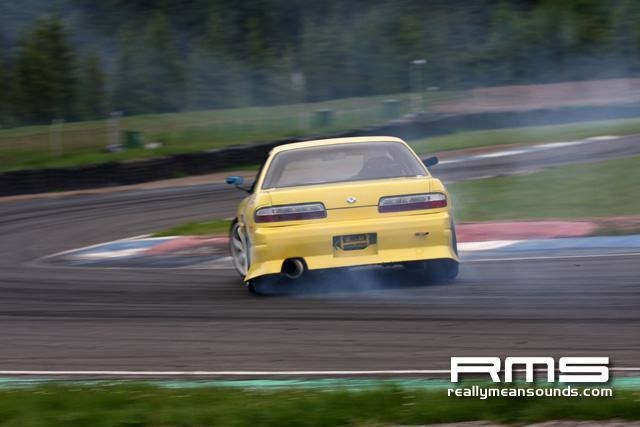 Huge amount of speed and angle going over the entry followed by a spin and plenty of Pirelli smoke. Never one to be phased, Paul persisted with his mega entries, spinning several more times before finally hooking up a full throttle run without straightening and very little handbrake practice makes perfect. 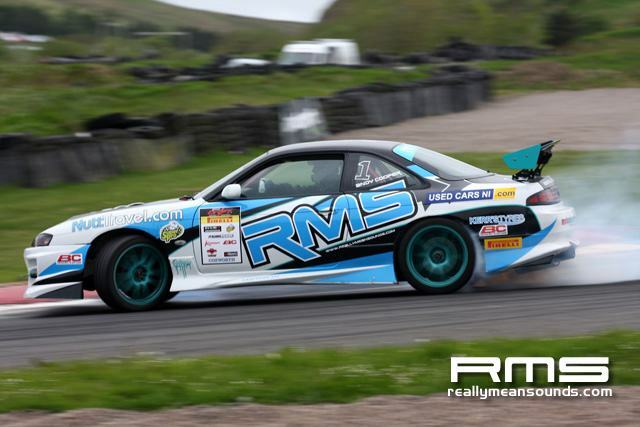 EDC newbie Vince Noot showed serious balls in his 1JZ PS13, using plenty of man-foot to attack Knockhill which, unbelievably, was his first ever outing on the track. 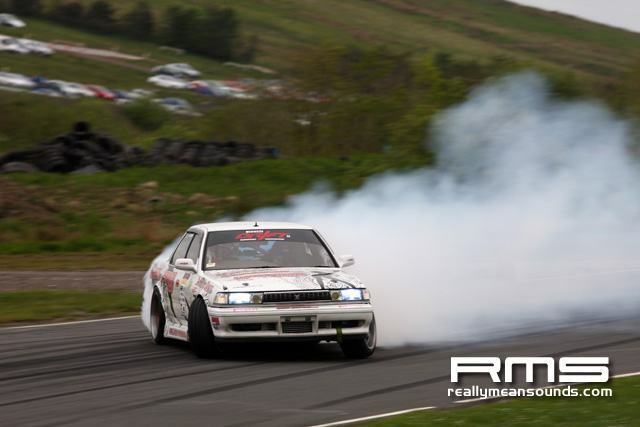 Andy Cooper in the RMS S14a was next to hook up a full throttle run, closely followed by the Cresta of Declan Hicks who absolutely loves this track. 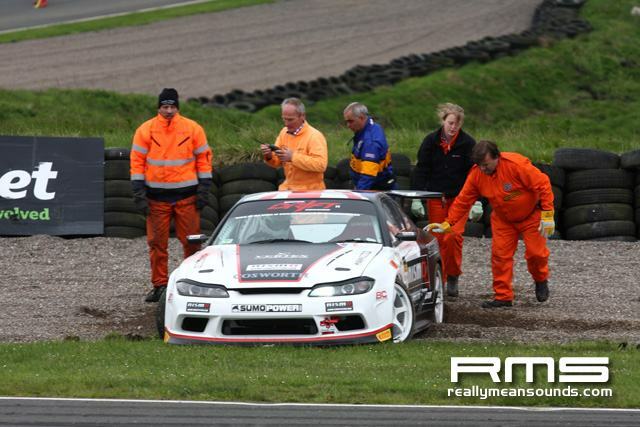 Brett Castle struggled with the Nismo S15 before a trip through the kitty litter ended his practice early. 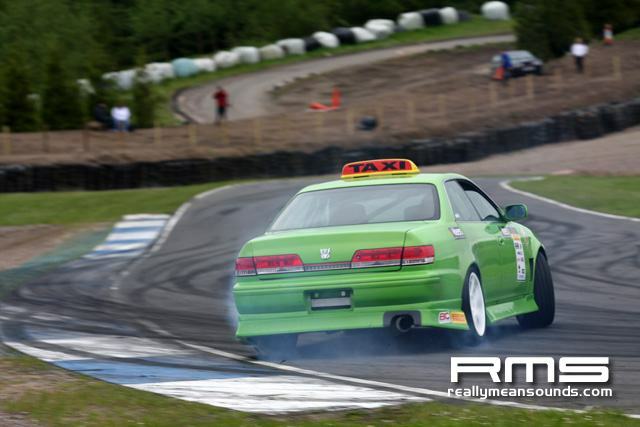 On the other hand, the Drift Taxi of Karl Farrar suited the long, sweeping Knockhill course perfectly despite being seriously down on power compared to his rivals. 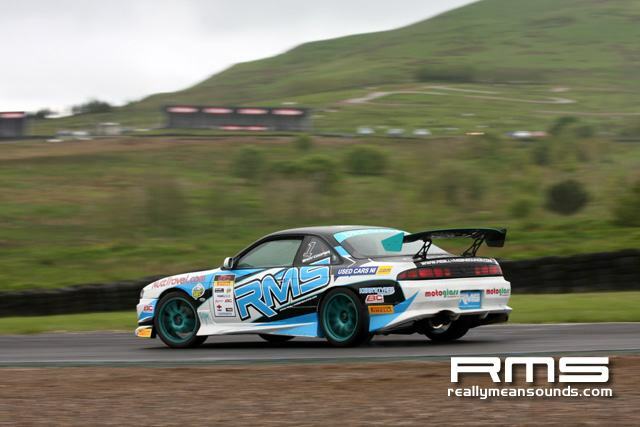 Into qualifying and Declan Hicks was simply on fire, proving run after run why Knockhill is his favourite circuit. The longer wheelbase of the Cresta gives a slight advantage on this high-speed, sweeping circuit but when it comes to twinning youll still need to be on guard for the more nimble, twitchier s-bodies which are more suited to the more technical part of the track. By mid practice Brett Castle had his technique mastered, with handbrake issues meaning he had to use nothing but weight shift and skill to transition through the mid section. 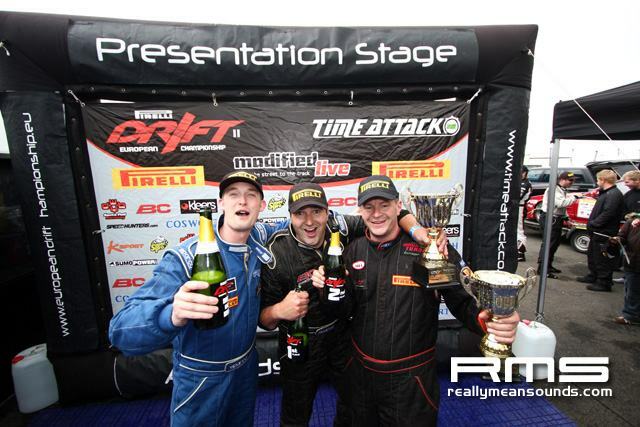 Paul Conlan continued to get faster and faster, eventually taking 1st place in qualifying. Vince Noot also had a cracking run which put him in 3rd qualifying. 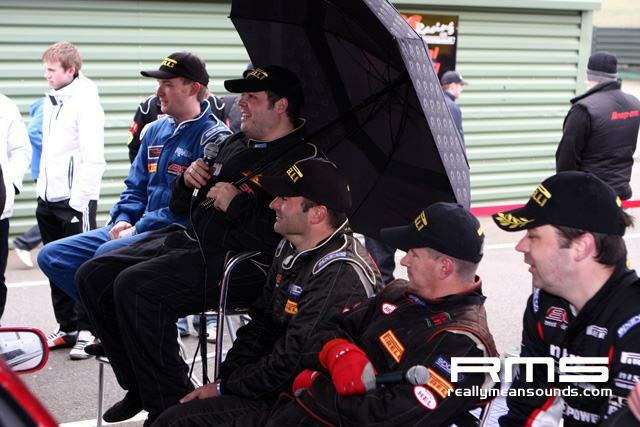 After each session the EDC drivers took time out to answer questions and be interviewed/embarrassed by commentator (and ex-driver) James Grimsby. Unlike other motorsports, the EDC encourages fans to come and chat with their favourite drivers and see exactly what goes in to each of these awesome drift machines. During the interviews, the drivers were quizzed about how their initial runs were going and what theyd do before the final eight. The main problem were having is the handbrake explained Brett Castle. Were still running a shoe setup as opposed to a hydraulic one, so were only getting around 1 practice lap with an effective handbrake before its too hot and useless. Well be running a hydro next round, but this time we have to just change the driving to suit where wed usually be on the wand. 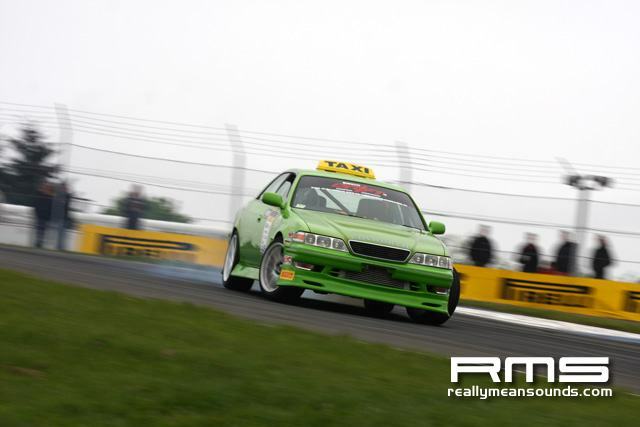 Oh, and last practice a boost hose blew so we were 200bhp down Karl Farrar, now in his second EDC round previously gave drift taxis to punters before stepping up to the EDC level. How has he found the move to EDC? It puts things in perspective explained Karl. The speed difference mainly, everythings a lot faster, and when youve got 320bhp (on a good day) in a big heavy car with 10in wide wheels and youre entry speeds are 80mph+ its yeah, very difficult but Im getting there. After lunch it was time for the top eight. With Paul Conlan qualifying 1st and no 8th driver able to make Knockhill Paul was given a by into the final four, but still put on a decent display to the crowd… albeit having a little spin. Next pairing was Brett Castle vs. local man Kieran Cameron. Despite a spin from Brett on the warm up, he showed no fear in the judged runs pulling away from Cameron with a 7-3 advantage. Second run with Cameron leading and Brett pulls out another faultless run while Cameron struggled putting the Nismo S15 through to the final four. Vince Noot faced Andy Cooper next, both performing strongly in their warm up run. Vince lead in the first run, and after going far too deep he narrowly missed spinning causing Andy to straighten. Vince finished the rest of the run strongly while Andy struggled, giving a 5-5. Second run and Vince manages to stick to Andys bumper right from the entry. Unfortunately hes carrying a bit too much speed and while Andy transitions well, Vince understeers locking all four wheels. A 6-4 advantage to Andy sees him through to the final. Last pairing was Declan Hicks vs. Karl Farrar. Declan leads first and pulls an absolutely faultless run, but despite being 200bhp down Karl manages to stick right on Decs bumper, with a slight straightening from Karl giving Dec the advantage. Second run and Dec runs wide dropping a wheel on the dirt and losing distance to Karl giving him the advantage One More Time. In the first OMT run, Dec shows why hes the king of consistency pulling out another faultless run. Karl doesnt put a foot wrong, but Dec gains enough distance to give him the advantage. Second run is exactly the same as the first, but another slight straightening from Karl gives Dec the advantage and a place in the final four. 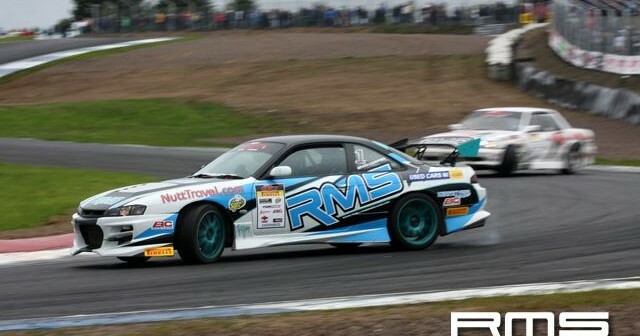 Conlan vs. Castle two of the most-experienced drivers competing in two very different Nissan S15s. 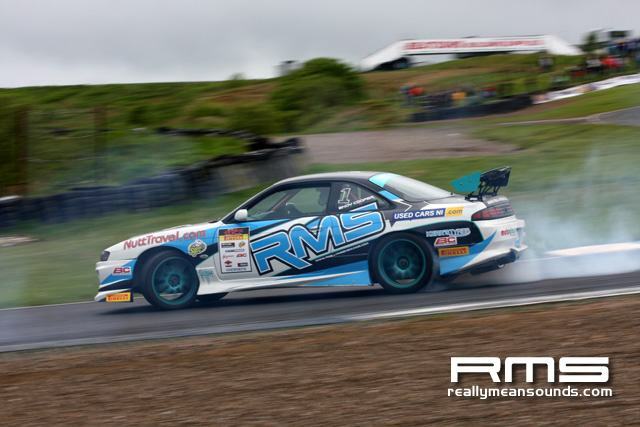 Unfortunately the Knockhill weather has drenched the track with water which, when youre running semi-slicks and going sideways, its not ideal as Brett proves spinning out on the first judged run giving Paul the advantage. Second run and now Paul has the problem massive understeer sends him clean off the course. Brett takes it easy and gets the advantage meaning One More Time. Conlan leads Brett in the first run and theyre both attacking hard, but Brett refuses to give an inch to Paul. With Brett now leading, Paul does the exact same thing putting him under serious pressure causing him to understeer ever so slightly. A super-close battle, but hard-charging Conlan goes through to the final. 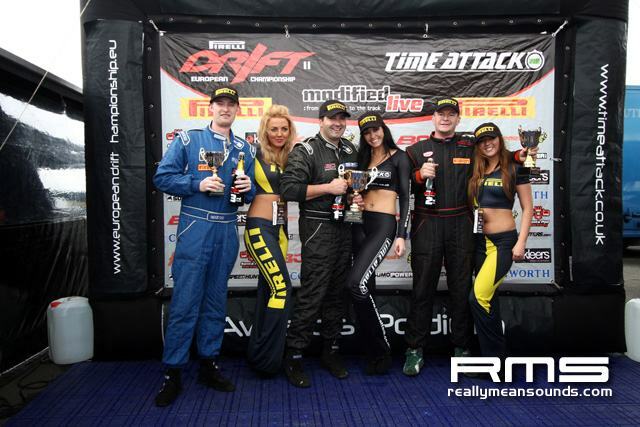 Andy Cooper faced Declan Hicks in the final pairing, and both drivers had been equally as consistent throughout the day. Declans entry is faster but he cant shake off Andy putting it 5-5 after the first run. In the second run, Declan leads and Andy manages to close a little distance after the transition. Unfortunately, Andy has to get back on the handbrake to continue his drift losing a lot of speed. Declan goes through with a 6-4 advantage. Unfortunately the 5/6th play-off couldnt take place as Keiran Camerons PS13 had power steering problems which saw him out giving Vince Noot 5th place. 3rd/4th playoff Brett vs Andy. Brett starts off strong, but hes taken a slightly wide line meaning hes got to clutch-kick to keep his drift going. Andy keeps a safe distance and takes the initial advantage 6-4. Knowing hes got to take the advantage, Bretts following run sees him go way too wide this time clipping the dirt and sending him into a spin. Once again Andy keeps his cool and takes a well-deserved third place for team Really Mean Sounds. Final time, Declan vs. Paul – two very different cars both powered by Toyota straight-sixes. Paul has shown more speed and aggression, but Declans been totally consistent all day. In the first run, Paul leads and Declan sits right on his bumper from the 100mph entry point. Paul has a little understeer but holds it well to avoid losing any points. Second run, and as both drivers come over the blind crest Paul repays the favour sticking his S15 right on the Crestas bumper. Paul needs a little handbrake to keep the drift before the right right turn but hes literally inches from Declan its too close to call meaning One More Time. First OMT run, Paul leads. 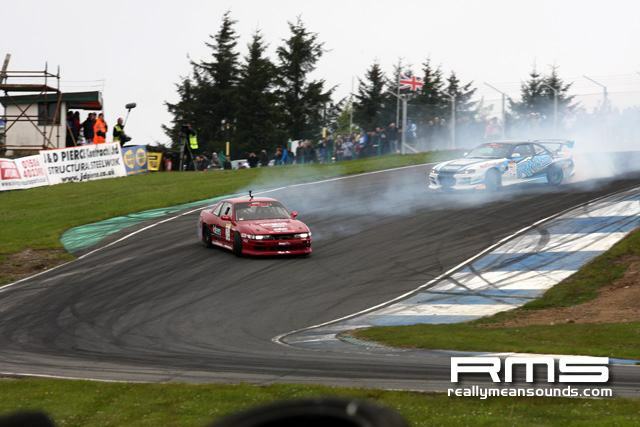 Theres absolutely nothing in it, Paul holds the perfect line while Declan stays close to the S15. Second run with Declan leading and Pauls on an absolute mission. Hes even closer than the first following run, so close that it looks like hes going to go for an overtake mid-drift. Paul backs off as they transition to avoid contact but is back on his bumper by the final turn. With a final charge like that Paul definitely takes the advantage, and with the drivers being 5-5 prior to the last run Paul also takes the win. Superb driving from both drivers. Despite finishing 7th, a big mention has to go to Karl Farrar who, in his 2nd ever EDC event, has showed major improvements in an underpowered car compared to his rivals – It wont be long before Karls fighting for a spot on the podium. 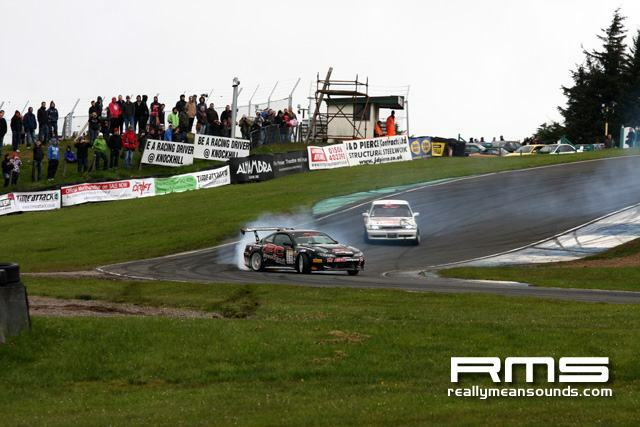 For Round 3 of the EDC were heading back down to England at the awesome Brands Hatch circuit. Over the June 25th/26th weekend both Round 3 and 4 will be taking place, so this is one action-filled weekend you wont want to miss.